Herbert Read’s father Henry Herbert Read, was born in Wincanton Somerset. In 1881 aged 21, he was living with his sister and Brother-in-Law William Midlam at 41 Victoria Road, St Sidwell. Herbert started his career working at the Harry Hems workshop around the corner on Longbrook Street. There he learnt the trade of traditional woodcarving, rising to foreman joiner and chief designer. In 1888, he left Hems’ workshop to start up on his own business on Sidwell Street, ‘St. Sidwell’s Art Works’. In 1891 he was living at 21 Oxford Terrace, St Sidwell with his wife, two daughters and one son, Herbert Edmund Read aged 6. Henry Herbert was described in the census as the manager ‘Art Works’. In 1901 the family had moved to 130 Sidwell Street and Henry Herbert’s occupation was described as Church Fittings maker. Henry Herbert Read died on the 8 March 1904 of pneumonia, at the age of 44 and his son Herbert Edmund Read, took over the business in 1908. In 1911 the Read family moved next door to 131 Sidwell Street, Herbert was the head of the house aged 26 and living with him was his mother Hannah, sister Rose and brother Robert, a joiner aged 19. He is described as a Sculptor and Carver (chiefly church furniture maker). He works from home and the postal address is St Sidwell Art Works, 131 Sidwell St, Exeter. Now occupying 130 Sidwell Street is Charles Hayward, Draper, who also works from home. One church commission, in 1922, was for a 7ft high, carved Calvary group added to the ancient screen of Alphington Parish Church. The First War memorial on the outside of St Olave’s Church on Fore Street is also the work of Herbert Read Jnr, dating from 1922. He was also noted for his restoration of the front of the Guildhall on the high street. Exeter Cathedral took a hit during the Blitz of 1942 and it was Herbert Read who took it upon himself to lovingly comb the rubble for several weeks in an effort to retrieve any lost or damaged items from the ruins with the aim of reconstructing. At the outbreak of war in 1939, he had already dismantled the bishop’s throne and stored away from the city to save it from possible attack. It was put back together by him at the end of the war. The St. Sidwell’s Art Works workshop was destroyed in the Exeter Blitz in May 1942. Although a large quantity of the firm’s correspondence and other records were lost, the drawings were kept elsewhere and were later discovered and moved to safety. These drawings were purchased by the Devon Records Office in 2006. The firm, then known as ‘Herbert Read Ltd’ ceased trading in the 1990’s having operated mainly in the conservation field for many years. Examples of their work can be seen all over Devon as well as Hampton Court Palace, The House of Lords and a colonnade from the Taj Mahal. At the time of his death on 2nd November 1951 he was living at ‘Penrose’ Magdalen Road, St Leonards. He left effects amounting to £29,984 to his wife Ida Helen Read. He was aged 66. 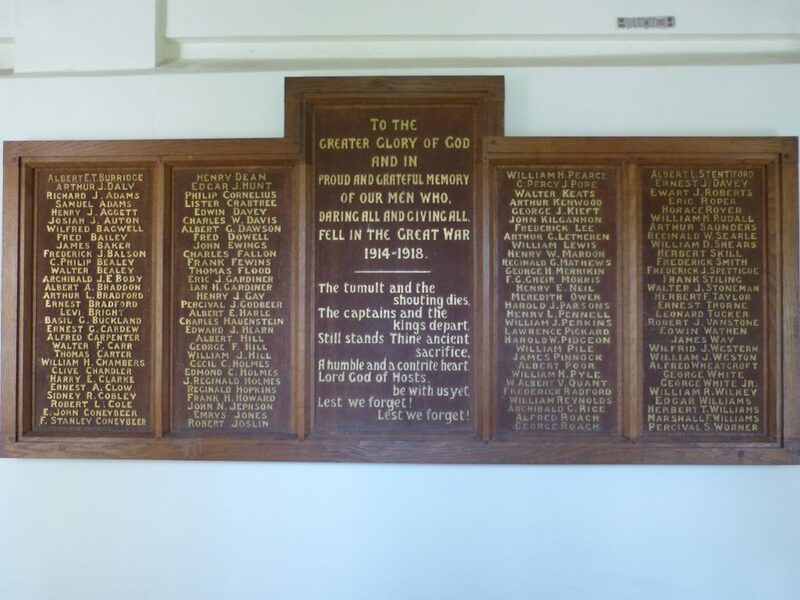 This War Memorial at St Sidwell's was made by Herbert Read.